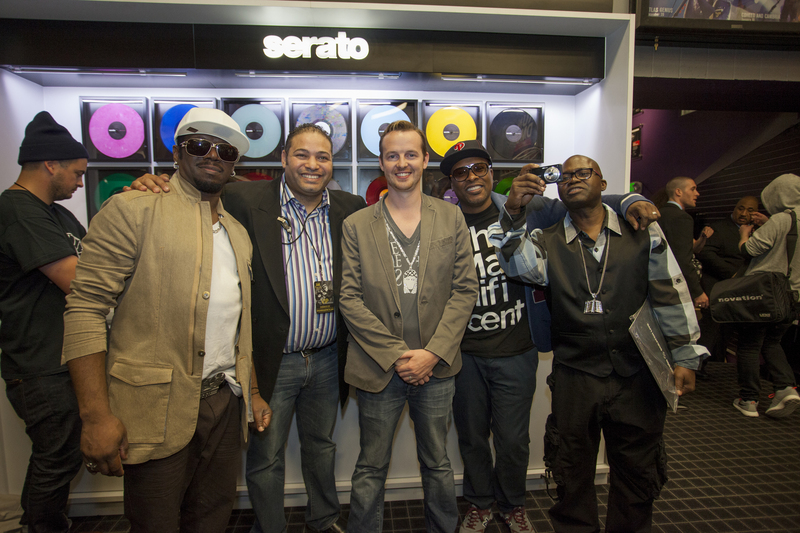 Pictured L-R: Sam Stokes (Artist Relations – Serato), Grandmixer DXT, Tony Baraz (Assistant Category Manager – DJ/Lighting/Live Sound, Guitar Center), AJ Bertenshaw (CEO – Serato), DJ Jazzy Jeff, and Grandwizzard Theodore, at the unveiling of the Serato DJ Experience area at Guitar Center’s Hollywood Store. DJ Jazzy Jeff, at the unveiling of the Serato DJ Experience area at Guitar Center’s Hollywood Store. Pictured L-R: Tony Baraz (Assistant Category Manager – DJ/Lighting/Live Sound, Guitar Center), AJ Bertenshaw (CEO – Serato), and DJ Jazzy Jeff, at the unveiling of the Serato DJ Experience area at Guitar Center’s Hollywood Store. Guitar Center has partnered with global Digital Music technology brand Serato to open exclusive new 400+-square-foot in-store space at Hollywood, CA location. DJ Jazzy Jeff hosted the red-carpet launch event and met with fans and customers. This event followed a related ceremony earlier in the day, at which Guitar Center helped induct world-renowned hip-hop DJ icons Grandmaster Flash, Grandwizzard Theodore and Grandmixer DXT into Hollywood's iconic RockWalk. 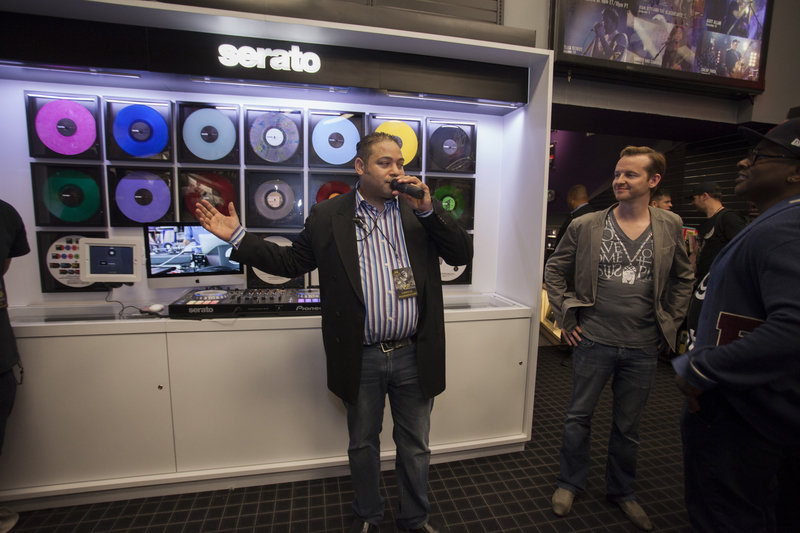 (Los Angeles, CA) – On Thursday, March 6, 2014, the Guitar Center Hollywood store was the place to be as they unveiled their new world-class addition to the store, known as the Serato DJ Experience (the second such facility, following the opening of the Brooklyn, NY facility in 2013). Created in association with Serato, the new wing offers a permanent home for DJ’s and aspiring music producers to demo and buy the latest products in Serato’s product line. This 400+-square-foot section of the store was officially launched with a special all-day red-carpet event, hosted by GRAMMY® winner DJ Jazzy Jeff and open to the public. This event followed a related ceremony earlier in the day, at which Guitar Center helped induct world-renowned hip-hop DJ icons Grandmaster Flash, Grandwizzard Theodore and Grandmixer DXT into Hollywood's iconic RockWalk. The event featured leading figures from Southern California’s hip-hop and EDM communities: D-Styles, DJ Nu-Mark, DJ P-Trix, DJ Rhettmatic, Mr Choc, DJ Shortee and more, several of whom also performed live. Also in attendance were representatives from manufacturer sponsors as well as leading journalists from the music industry. The new addition coincides with the expansion of Guitar Center’s hugely popular Music Mentor program (offering customers free lessons and instruction for top DJ and Digital Music products). Event sponsors included Pioneer, Numark, GoPro, JBL, Rane, BBE, QSC, American DJ, Odyssey Cases, EV, Akai and TC-Helicon. Photo Caption 1: Pictured L-R: Sam Stokes (Artist Relations – Serato), Grandmixer DXT, Tony Baraz (Assistant Category Manager – DJ/Lighting/Live Sound, Guitar Center), AJ Bertenshaw (CEO – Serato), DJ Jazzy Jeff, and Grandwizzard Theodore, at the unveiling of the Serato DJ Experience area at Guitar Center’s Hollywood Store. 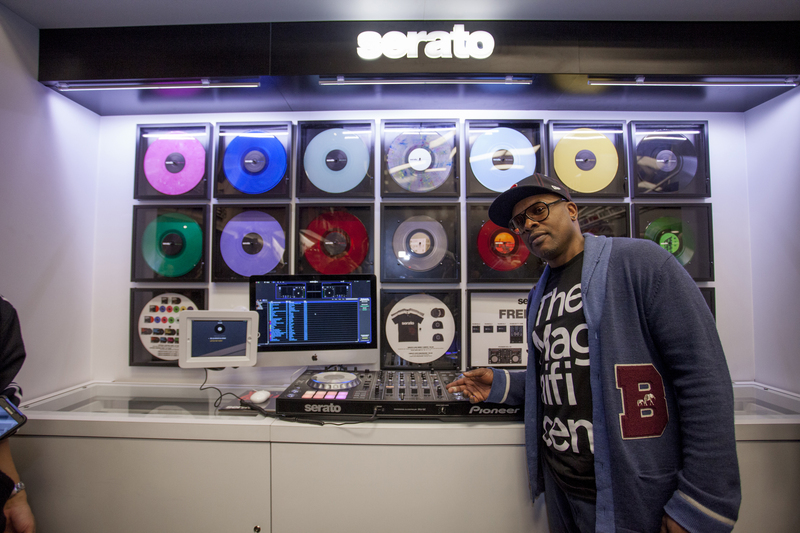 Photo Caption 2: DJ Jazzy Jeff, at the unveiling of the Serato DJ Experience area at Guitar Center’s Hollywood Store. Photo Caption 3: Pictured L-R: Tony Baraz (Assistant Category Manager – DJ/Lighting/Live Sound, Guitar Center), AJ Bertenshaw (CEO – Serato), and DJ Jazzy Jeff, at the unveiling of the Serato DJ Experience area at Guitar Center’s Hollywood Store. Guitar Center is the world's largest retailer of guitars, amplifiers, drums, keyboards and pro-audio and recording equipment, with 258 stores across the U.S. In addition, the Music & Arts division operates more than 100 stores specializing in band instruments for sale and rental, serving teachers, band directors, college professors and students since 1984. This year marks the 50th anniversary of Guitar Center’s historic first-steps to helping people make music. With an unrivaled in-store experience and passionate commitment to making gear easy-to-buy, Guitar Center is all about enabling musicians and non-musicians alike to experience the almost indescribable joy that comes from playing an instrument. All we sell is the greatest feeling on earth.